Hi friends, I know that you are a big fan of Gaming and that is why you click on this and you want to know the Best Phones for Gaming then here you are is in a right place. 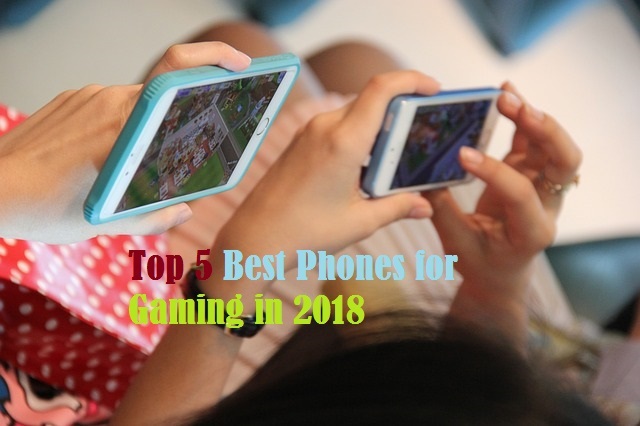 In this Article, I will tell you the Top 5 Best Phones for Gaming in 2018 and with the help of this, you will easily entertain yourself. If you want to buy a Phone and then you are giving a great amount of money but after that maybe you will not get the best Phone then what will happen, we all know this, you will waste your money. And how is this, if I will provide you the Top 10 Best Phones for Gaming in 2018 and with the help of this, you will buy a great phone and I am damn sure about this, you will not face any problem while playing a Game. If your phone considers these three things then just go and buy. You can buy this either go shopping or purchase online. But I will suggest you, Purchase Phone online because here you will get lots of offers. Now in today’s life, Developers had developed so many amazing phones and Games like PUBG Mobile, Fortnite etc. and when you will play that Games, you just enter the world of Imagination. So as a result of this, I create the list of Best Phones for Gaming. As we all know that, MAC is not good for playing the games but when we talk about the Apple Iphone X then it is superb for playing the games and anything else. We also know that the Battery life of Iphone X is slightly bigger than iPhone 8 plus. That’s why I put Iphone X in the first position of Best Phones for Gaming. If you will see the specification of Samsung Galaxy S9 Plus then these specifications clearly is in the favor of Gaming Phone. You just look at the RAM of this Smartphone, It’s an amazing. And hence, as a result of this, I put Samsung Galaxy S9 Plus in the second position of Best Phones for Gaming. Apple introduces two big phones i,e Iphone X and Iphone 8 Plus and both these phones are having big Screen and high RAM which results to play the Good Game without any Problem. And hence, as a result of this, I put Iphone 8 Plus in the third position of Top 5 Best Phones for Gaming in 2018. Razer Phone is that Phone which is designed only to play the Games just similar to the oppo and Vivo which are designed for Camera. Now Let us Recall the Specifications of Razer Phone. One of the best things about this phone is that its Big RAM and Size and Backup. And hence, as a result of this, I put Razer Phone in the fourth position of Top 5 Best Phones for Gaming in 2018. One of the best phones of Motorola Company is Moto Z2 force which has a computer like Game Controller and with the help of this Controller, you can play a superb game and entertain yourself. Now let us recall the specifications of Moto Z2 Play or Moto Z2 force. And hence, as a result of this, I put Moto Z2 Play in the fifth position of Top 5 Best Phones for Gaming in 2018. So, friends, I told you the Best Phones for Gaming and if you have any query about this, then put your question in comment section. I will reply to your comment as soon as possible and thanks for reading this Article and also share this article with your friends and family. Must Follow us on your social networks.